SQ is a very recent user of glittery embellishment on quilts – sparkly bugle beads, faceted fake gems, opalescent ovoid pearls and the like. It all began in Joann’s at the button display under a sign that said 50% off. Well, SQ felt the need for some whimsical buttons for a quilt and was taken with little ladybugs. And there, on the next row, was a bag of faceted square stones in soft purples, greens, and aquas. And they cost $2.20 for 41 of them ($1.10 at 50% off.) I thought the colors would go great with an atypically pastel quilt made with McKenna Ryan fabrics that already was embellished with rattail cording and ribbon. After experimenting with invisible nylon thread to sew on the fake gems and giving that up for dark gray Aurofil cotton, SQ sewed on all 41 of those suckers. And then came the thought- you know, maybe it could use more embellishment. Unsure of her judgment in this, SQ asked the opinion of a friend who happens to be an old hand at embellishment. The friend said yes it could stand a few more sparkles, and graciously opened her Aladdin’s cave of embellishment supplies. So now SQ has various containers of ominously small size beads in lovely colors to sew on her quilt. What will come first, over embellishment or frustration with the whole process of sewing on all those little beads? 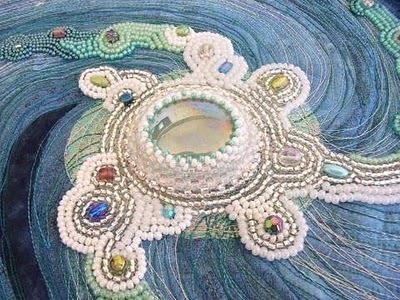 For inspiration, here’s a close up of “Cosmic Catherine Wheel,” a beaded wall quilt by Australian Fiona Hammond.